Erin Courtney, spokeswoman for the MTA, said the highway held a 70th birthday party at its Portland headquarters. The highway opened on Dec. 13, 1947. 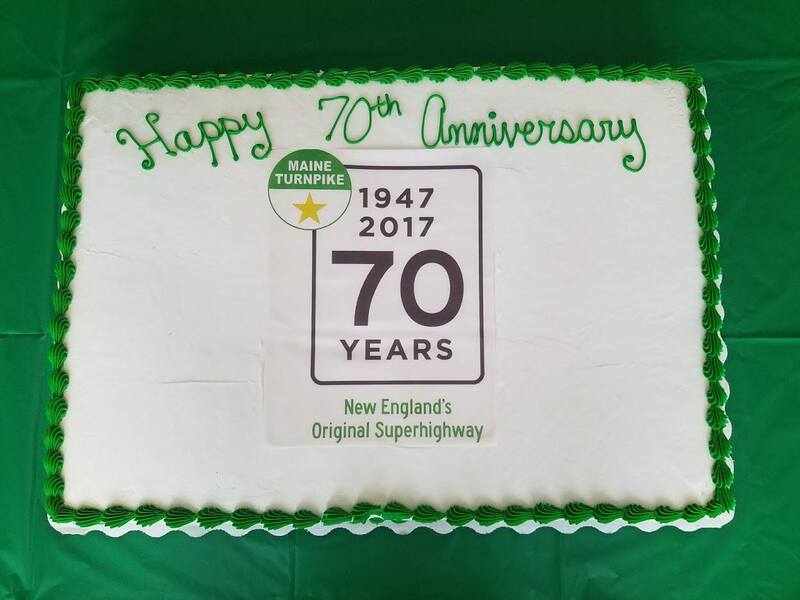 After former Chief Justice of the Maine Supreme Court, Daniel Wathen – he serves as chairman of the MTA’s board of directors – cut a gigantic 70th birthday cake inscribed with “New England’s Original SuperHighway,” the staff delivered cupcakes to all of the organization’s toll takers and maintenance yard workers. Engineers have nearly finished what the headline called the ‘Hall Carpet Into Maine.’ They hoped for an opening to the extension to the Maine Turnpike to be Dec. 1. The new section of 66 miles of superhighway featured different bridge design and a center that was concave, not convex. This photo shows the Portland-Westbrook interchange with Brighton Ave. in the foreground leading, left, to Westbrook and, right, to Portland. The City Hospital is shown on the right. Caption published in the Nov. 6, 1955 Telegram. “With 70 years of history, more when you consider the Legislature created the Maine Turnpike Authority in 1941, it is important to remember the thousands of Maine people whose hard work is responsible for the Turnpike of today,” Maine Turnpike Authority Executive Director Peter Mills said in a statement. Courtney said before the 47-mile-long turnpike opened it took drivers as much as a half day to drive on Route 1 from Kittery to Portland. “The Turnpike was Maine’s first roadway with a posted 60 mph speed limit. Few New Englanders in 1947 had ever driven that fast,” the MTA said in a release. In 1956, the turnpike was extended 66 miles from Portland to Gardiner, including the four-mile-long Falmouth spur.